Discover which interfacing and purse hardware you need to make detailed and structured bags. Each attendee will go home with an interfacing charm pack of products that Sara Lawson uses to make her bags. Also, see Sara's trunk show of fabulous bags! Her grandmother, mom, and aunt all sew. Sara's grandmother is very good at making and altering clothing. When Sara was in 3rd grade, she learned sewing basics when her mom taught her and her friend a little sewing class once a week. At the time, she loved all sorts of crafty things; therefore, sewing took a back seat for a long, long time. She began sewing again when her first child was born... At first it started out as a weekly goal to complete a little sewn project, but soon she was spending every free hour in the evening sewing. She was obsessed. Sara is an avid bag maker, sewer and creator of the popular blog SewSweetness.com, has a passion for sewing and sharing her creativity and patterns with others. 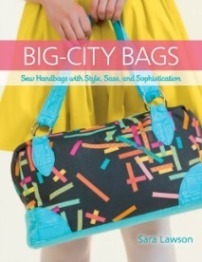 Her book, Big-City Bags, was published by Martingale on November 5, 2013. She is working on her second bag sewing pattern book. IMPORTANT - students will be required to cut fabric and fuse/baste their interfacing before coming to class. Workshop cost and supply list will be posted closer to the class date.